The church has changed so much in recent years and has “left her first love”. An astounding number of churches today, teach doctrines of demons (1 Timothy 4:1 – “But the Spirit explicitly says that in later times some will fall away from the faith, paying attention to deceitful spirits and doctrines of demons”). We see in Revelation Christ’s rebuke of the church at Laodicea, the “lukewarm” church, which reflects the likeness of the church of the last days. (Revelation 3:16 – ‘So because you are lukewarm, and neither hot nor cold, I will spit you out of My mouth’). The candlestick of this church is still in place (note Revelation 1:20 – “As for the mystery of the seven stars which you saw in My right hand, and the seven golden lampstands: the seven stars are the angels of the seven churches, and the seven lampstands are the seven churches” and in (Revelation 2:5 – ‘Therefore remember from where you have fallen, and repent and do the deeds you did at first; or else I am coming to you and will remove your lampstand out of its place–unless you repent”), but it has become a neutral church, “neither cold nor hot” (Revelation 3:15 – “I know your deeds, that you are neither cold nor hot; I wish that you were cold or hot”). The reason for its lukewarm witness is because it has become “rich, proud and increased with goods”. The churches may have acquired large and beautiful facilities, developed special programs of many kinds, featured a variety of theatrical performances, and even gained a measure of political power. Yet, Christ calls it poor, blind and naked! The warnings to the churches shows us that the development of such complacency in any church, be it large or small, is the neglect of these three doctrines – the sufficiency of Christ, the inerrant authority of God’s Word, and the special creation of all things by God. 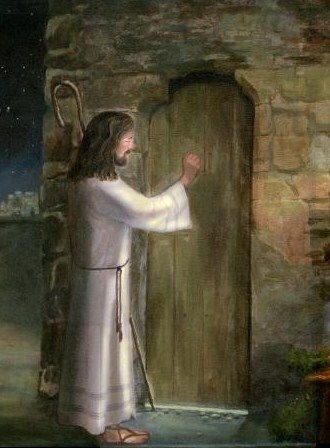 The letter to this church ends with the sad picture of Christ standing at its door, seeking admission (v. 20 – ‘Behold, I stand at the door and knock; if anyone hears My voice and opens the door, I will come in to him and will dine with him, and he with Me.) and continues in (v. 22 – “He that hath an ear, let him hear what the Spirit says unto the churches”.